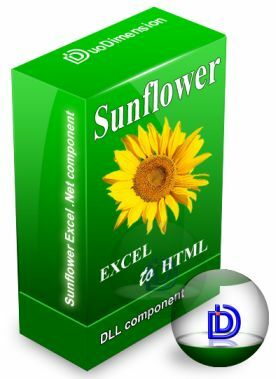 Sunflower Excel .Net is a non-graphical component that enables in windows applications to convert automatically Excel Spreadsheet XLS to HTML . It also supports converting XLS files to other Microsoft Excel(R) files such as CSV, TXT, XML, XLSX (only for Microsoft Office(R) 2007 and above). The component requires Microsoft Office(R) installed. Sunflower Excel is .Net component to convert Excel Spreadsheet XLS to HTML. ...... The component is very easy to use and is provided with 2 fully featured demos written in both C# and Visual Basic. It also allows you to create your own windows applications that will be able to convert one or batch of Excel files. 2. Convert Excel files to different formats TXT/CSV/HTML/XML/XLSX. 4. Strict copying of XLS file formatting. 5. You need just 2 lines source code for successful conversion. FlexCell is an easy to use .NET grid control. Qweas is providing links to Sunflower Excel .Net 2.2 as a courtesy, and makes no representations regarding Sunflower Excel .Net or any other applications or any information related thereto. Any questions, complaints or claims regarding this application Sunflower Excel .Net 2.2 must be directed to the appropriate software vendor. You may click the publisher link of Sunflower Excel .Net on the top of this page to get more details about the vendor.